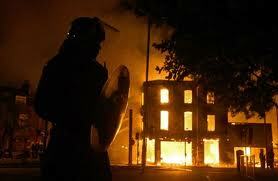 Pub owners have spoken of their horror as the riots in London continued for a third night. Landlords have described the “war zones” in which pubs have been set on fire and customers targeted for mass-muggings as balaclava-wearing youths ran amok in town centres across the country. Alan McCabe, owner of the Old Fox and Hounds pub in Croydon, south London, told the BBC: “It kicked off very quickly, very sharpishly, and we tried moving people out the pub as fast as possible. “We blocked up the front doors and moved them out the back. I ripped off all the spirits off the optic behind the bar, so that if anyone did break in they couldn’t be Molotovs. “Unfortunately I had a 90 year old woman in the pub. She comes in for a cup of tea, a nice quiet woman. She got a little wound up so I carried her across the road to the police who were very accommodating.